The 7810 series of Transconductance amplifiers is the latest innovation for high current, wide bandwidth AC current outputs. It operates from DC to 100kHz with very low distortion. By connecting the output from a stable voltage source, the 7810 is capable of producing currents up to either 50A or 100A over a specified frequency range of DC to 100kHz. With an embedded Windows 10 computer and touch sensitive colour screen, the 7810 is very easy to use. It can calibrate any device requiring a known stable source of AC current up to 100A, manually or via automation. 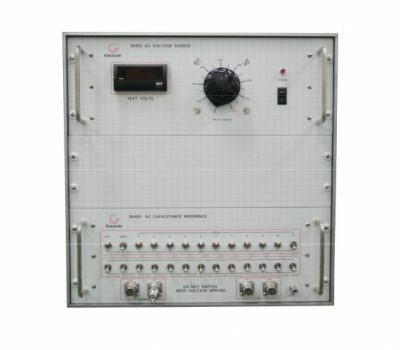 The transconductance amplifier satisfies AC current measurement requirements at power frequencies and at higher frequencies up to 100kHz. The output currect from the 7810 is based on a unique patented multi cell current source array developed at Guildline Instruments. This output array is extremely stable, with zero drift of ess than 50ppm/hour at 100A at 100kHz. The 7810 also offers an impressive 7 to 9 V output compliance voltage.